Brands > Grasshopper > 700 Series Front Mount Zero Turn Mower > 532127 Grasshopper 725DT6 Diesel Front Mount Mower - 61"
532127 Grasshopper 725DT6 Diesel Front Mount Mower - 61"
The Grasshopper Model 725DT zero-turn riding lawn mower provides the fuel economy, speed, performance, durability and versatility you need for year-round profitability to the landscape professional. 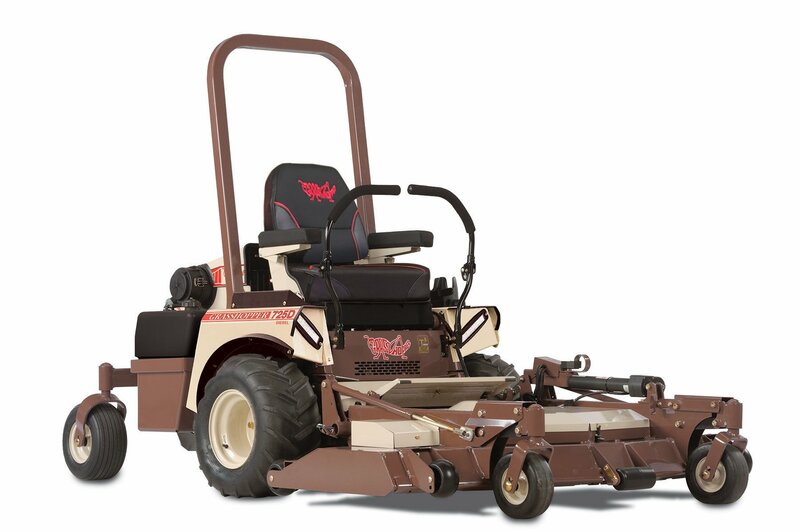 This front-mount mower is powered with a fuel-efficient, Tier 4 final-compliant, MaxTorque™ diesel engine. Perform a wide range of grounds maintenance tasks with a number of implements that replace the front-mounted deck. Exclusive PowerFold® deck lift/electric height adjustment feature raises the deck to fit more on a trailer or for easy underside deck cleaning. Come talk to us at The Water Shed to assemble a Grasshopper 725D that fits your needs! Copyright © 2007-2019 - The Water Shed Inc.